Best Adjustable Dumbbell Set 2019- Includes Videos! It can be quite confusing trying to choose an adjustable dumbbell set, different weight ranges, different adjustment systems and varying degrees of build quality, they can also be expensive and when you’re spending upwards of $300 for some of the high-end adjustable dumbbells sets you need to have all the information available to make sure its the right choice for you. I’ve picked out 6 of the very best adjustable dumbbells sets on the market, we will take a close look at the most important features of each dumbbell set, taking into consideration the dumbbells pros, cons, price range, adjustability speed, weight range and build quality. Nothing is missed out in our reviews, there’s also a helpful video at the end of each review and a link to our full in-depth review of that particular pair of dumbbells. As with most reviews I read, my first thought is…Does this guy know what he’s talking about? I hope you trust I do! I’ve been lifting weights for over 20 years, 10 of those in a commercial gym and the other 10 at home. I have at least 15 friends who train at home, so I’ve owned, seen, tried just about every adjustable dumbbell out there. I know what works and I know what doesn’t. First were take a quick look at the comparison table, here we have our Top 3 adjustable dumbbells, followed by the next best 3 available. A fantastic set of adjustable dumbbells from Powerblock, these guys have been producing dumbbells for the past 25 years so you can trust they know what they’re doing. This is a review for the most popular of Powerblocks ranges, the Powerblock elite range. The sets come in 50lb, 70lb and 90lb, to understand this better you can buy the 50lb per dumbbell set and because the sets are expandable, you can, when you progress and become stronger, buy the 70lb or 90 lb expansion packs, or similarly buy the 70lb set and upgrade it with the 90lb expansion pack later on. For the sake of saving some cash for intermediate to serious weightlifters, the 70lb per dumbbell set is recommended, this is an excellent weight range that most will not outgrow. Let’s not forget the elite 50lb set is still a fair amount of weight that many of you may never outgrow, or take years to do so before you will need that extra expansion pack. So think carefully here what set suits your needs best. Much quicker to adjust in 5lb increments than the Ironmaster, literally takes a few seconds! The Powerblock elites use a magnetic selector pin to adjust the weights, as can be seen, and much better explained in the video below. But that’s not all with this set, what makes them just as versatile as the Ironmasters is the option to change the selected weight in 2.5lb increments, which is done using a 2.5lb cylinder placed in the handle. The Powerblock adjustable dumbbells weight range is selected through a stacking system, the reason this is important is that it will allow for a much more compact dumbbell compared to a dumbbell with a fixed handle length. The Powerblocks dumbbells only increase in length as the weight is increased, similar to the Ironmaster but faster to adjust as you do not manually have to add or remove weight plates. Surprisingly these dumbbells have been reported to be very tough and with a 10yr warranty it looks like Powerblock can back this up, that’s actually a long warranty for an adjustable dumbbell that has a fair bit of plastic inside it. Official word from Powerblock is not to drop them from a height any higher than 6-12″, I’d advise not dropping them at all if you can avoid it. 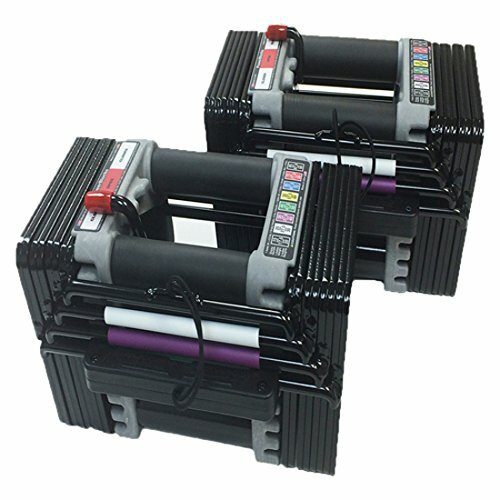 After reading through many, many reviews of the Poweblocks there doesn’t seem to be any serious complaints about durability even from guys who have had them a few years. I’ve had a few curls with one of these and must say they looked a little strange when I first laid my eyes on one, but once I had picked one up and done a few curls the shape and length of the dumbbells worked well, no hits on the hips, they were compact and comfortable. Overall an excellent set of adjustable dumbbells, Powerblock have put a lot of thought into their elite range and it shows with their compact design, fast adjustment times and the highly versatile weight ranges. There’s something here to suit about every weightlifter out there. The Ironmaster adjustable dumbbells make it to joint no.1 spot in our review. They are, by a small margin the best adjustable dumbbell on the market right now. 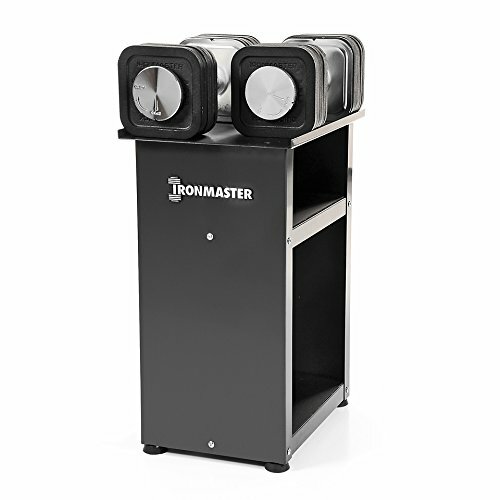 Ironmaster has done what Ironmaster do best, they have really thought about what a serious weightlifter wants from a dumbbell and they have delivered exactly that. A very nice compact design makes the Ironmasters more than desirable, no overly long handles here, the compact design gives you a dumbbell that reflects the natural feel we all like from a fixed weight dumbbell. The length of the Ironmaster dumbbells’ handles only increase in length when extra weight is added. A little slower to adjust than the Core Fitness, Bowflex and Powerblocks the Ironmaster dumbbells adjust using a metal locking pin. To lock them, you slide the steel locking pin through the dumbbell until it reaches its stopping point, with a half twist of your wrist it then locks in place. It’s nice to see the locking pins are knurled on each end, the knurling will give you added grip when hands get a little sweaty, a nice touch from Ironmaster. The locking pins lock extremely tight with no rattles from the weight plates. By far the most solid of the new school adjustable dumbbell sets, the weight plates are square and have indented groves that attach together with 1″ size holes, machine fitted to prevent any of that unwanted rattle. There’s no need to worry about plastic coasted weight plates here, the Ironmasters will survive drops at height, I can happily say there’s no plastic in sight. At 75lb per dumbbell, the Ironmasters should suit just about anyone from the beginner to the more experienced weightlifter, 32 different weight settings make this set highly versatile, adjustable in 2.5lb increments. There’s no need to stress about outgrowing this set. The Ironmaster set is expandable with the company selling separate expansion sets: set 1 – up to 120lb per dumbbell and the second set a whopping 165lb. Great news for serious strength and bodybuilders. The 75lb set sells for around $600, this is a fair price for an adjustable set that offers a lifetime guarantee and the option for adding extra weight in the future, not forgetting the fantastic quality stand to store the weight plates and handles. A rock solid dumbbell set to last a lifetime. There is a 45lb per dumbbell set on offer for the less serious among you, that comes without the stand for about half the price. Recommended if you have less cash to splash, and don’t forget you can beef it up in the future with an expansion pack. The Bowflex series of dumbbells have become by far the most popular set of adjustable dumbbells on the market right now. The reason for the popularity may be their respected name in the home gym industry. But on the most part, the reason these dumbbells became so popular is that Bowflex introduced an adjustment system that you change with a simple twist of the wrist. It was something new to the adjustable dumbbell market and it has helped sell thousands of the adjustable dumbbell sets. The Bowflex 552 pair has a weight range of 5-52.5 lb, adjustable in increments of 2.5lb up to 25lb and in 5lb increments thereafter, replacing 16 pairs of standard fixed-weight dumbbells. Whilst not being the best set of adjustable dumbbells on the market, they were the first to introduce the Selecttech adjustment system, each dumbbell has it own dial system on each end, simple to use, just twist the numbered dial to the amount of weight you want to select, it’s very easy to do and very fast. What’s nice about the Bowflex system is you can select different weight settings on either end. This will allow for some offset training. Not a particularly important feature but experienced weightlifters might get some valuable use from this feature for exercises such as farmers’ walk, hammer curls, lunges etc. This feature coupled with the 2.5lb increments settings are the only reasons the Bowflex dumbbells are ranked above the Corefitness adjustable set. With a non-expandable weight range of 5-52lb, the Bowflex adjustable dumbbells will not appeal to the more serious of weightlifters. this set is geared toward the beginner-intermediate weightlifting market. And I’m sure 1000’s of these sets sell to fitness fanatics who do not need a particularly heavy set of dumbbells for their resistance training. Remember with the Bowflex 552’s there’s no way of adding any extra weight to the existing 52.5 lb per dumbbell. It should be more than enough weight for most people but you will have to buy a completely new set of dumbbells if you need something heavier in the future. With a Bowflex product, you usually are treated to premium quality and the dumbbells are no exception, I like the ergonomic handle which is slightly rigid and makes for a comfy non-slip grip. The weight plates are coated with a thick super hard plastic and look to be fairly durable. As with all of the fast adjustment systems the amounts of plastic used is worrying. The use of plastic is probably the Bowflex’s biggest con, plastic surrounds the plates and some plastic is used in the handles which means you will have to be careful when training with the Bowflex dumbbells. There will be no dropping from height or throwing around these dumbbells, you will more than likely crack the hard plastic surrounding the weight plates which is not covered by the 2 yr warranty Bowflex offer. The longest of all handles make the Bowflex the least compact of all of our adjustable dumbbells in this review. The reason the handles are long is that they go through the entire set of weight plates, the handle is a fixed length so no matter how much weight you select the handle length will stay the same. Long handles can prove to be awkward especially to beginners who are not used to handles of this length but its something you can get used to after a few weeks and hopefully will not affect your training in a negative way. There are 1000’s of reviews of the Bowflex dumbbells and only a small number of people had serious issues with the handle length. Overall a very nice set of dumbbells from Bowflex, not as versatile, durable, or compact as the Ironmaster and Powerblocks but a great set of adjustable dumbbells, high in quality with a decent weight range, the Bowflex 552’s shouldn’t disappoint most who buy them.